The study of groundwater–river relationships is a challenge for water supply management. In order to provide an indicator for Inversac (Estavelle) events in a karstic aquifer, the water and sanitation department of Dijon Metropole tested a chlorophyll-a probe in addition to pressure and temperature probes. The field tests were performed in karstic Bathonian limestones near a canal, where eutrophication occurs in summer. The study site, called Crucifix site, was chosen based on tracer tests showing a probable infiltration of surface water. The Crucifix site gave the opportunity to study simultaneously a karst system in a natural spring alimented by a karstic conduit, and in a nearby well used for drinking water supply. The survey was performed during one week, with a pumping test lasting 24 h at the beginning of the survey. The results indicated that temperature and water level monitoring were not able to detect unambiguously inflow of surface water. In contrast, the chlorophyll-a probe allowed to detect reliably surface water inflow, because chlorophyll-a is naturally absent in groundwater. 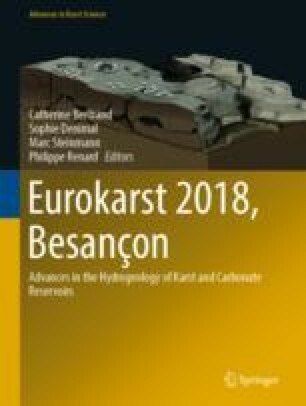 This form of monitoring is therefore a promising tool for water supply management and its implementation should be generalized for karstic springs influenced by surface water. This study would not have been possible without the support and the interest of Dijon Metropole and Suez Eau France. The authors dedicate this paper to Yves Lemoine, CPGF geophysicist, who first proposed the location of the Crucifix well after geophysical prospecting.